Yesterday, while I relaxedly exited my massage studio after giving a nice rub to a client, I heard an airplane flying low. I thought to myself, that sounds like the CalFire spotter plane. I waited to catch a glimpse before I carried on my way, and indeed, noted the telltale double tail of the white spotter plane, circling low over Petrolia. Hmmm. That's not such a good sign. Next, I contemplated whether or not I could smell smoke. I could not. But my internal alarms began to go off a few moments later when a much larger bomber airplane circled in and flew overhead, barely above the tall fir trees in Seth's backyard. 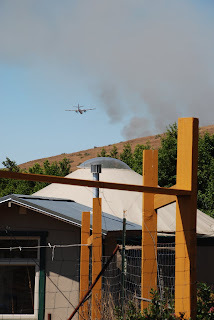 Then I knew that they were dumping retardant on a fire in the immediate vicinity. Knowing the geography, I surmised that the fire must be in the direction of my house. It was time to go investigate. I knew that Drew would already be at the scene with the Petrolia Volunteer Fire Department, in his wildfire turnout gear, running an engine, but I wasn't sure where Ella was, as she had gone with a babysitter that morning. 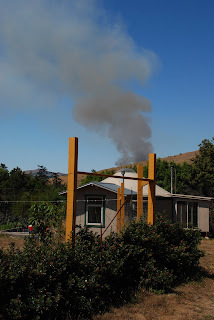 As I drove to the firehall to drop off Drew's wayward two-way radio, I quickly saw the smoke, billowing in a tall column just above Petrolia, on the west side of the knoll that borders our property, in a thick stand of scotch broom. Uh. Oh. But fortunately for all, the day was not so excessively dry or windy, as the fog and dew had been heavy the night before, and the wind was rather calm. CalFire was quick with their air support. Not long after the three bombers arrived to dump borate on the fire, the helicopter with a bucket arrived, and made quick trips to the river (?) or the estuary (? ), and two private bulldozers cut a fireline to the east of the fire. The fire was less than a mile from the fire hall in Petrolia. Drew had also mowed a little of the broom on that hill a few months back, which allowed the firefighters to get better access to the active fire. Within an hour or so, it was under control, and everyone went back to their regular day. Each time it happens, we all get a little rattled, and are reminded that it's not a matter of if, but when a fire will happen. We wonder if we'll be ready. We have so much more we should do to be prepared, including storing more water, having a stand pipe with fittings that work with the fire department's hoses, having an independent pump, and of course, having really solid "defensible space". May we all be more careful, and prepare as our means allow, so we can all help keep each other safe.